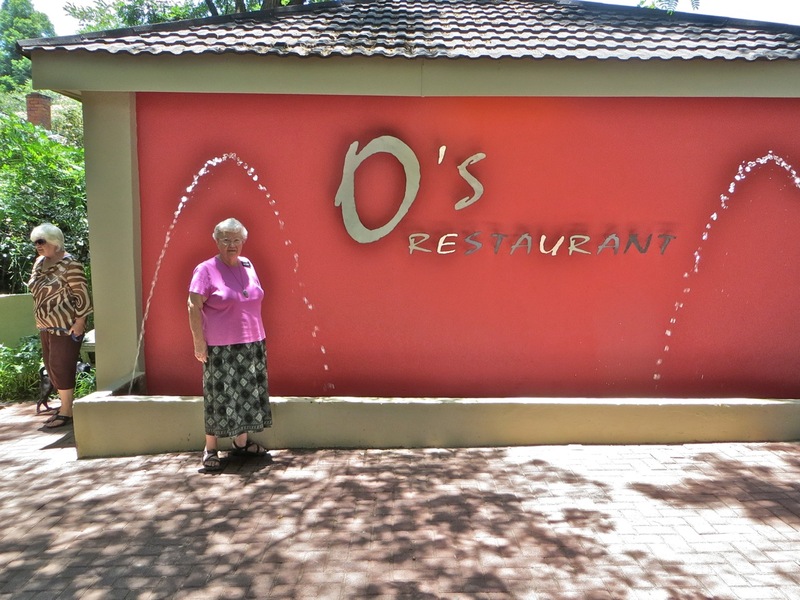 This entry was posted in Between on November 30, 2014 by Bill. 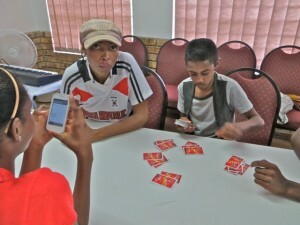 On Friday the new Ikageng district met for the first time. 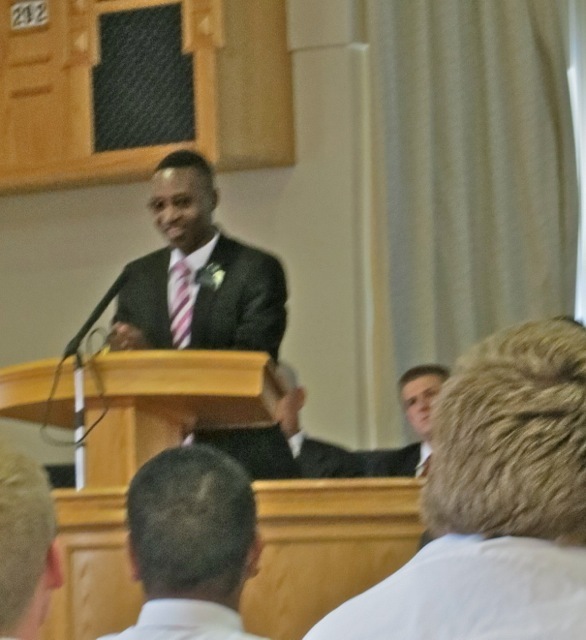 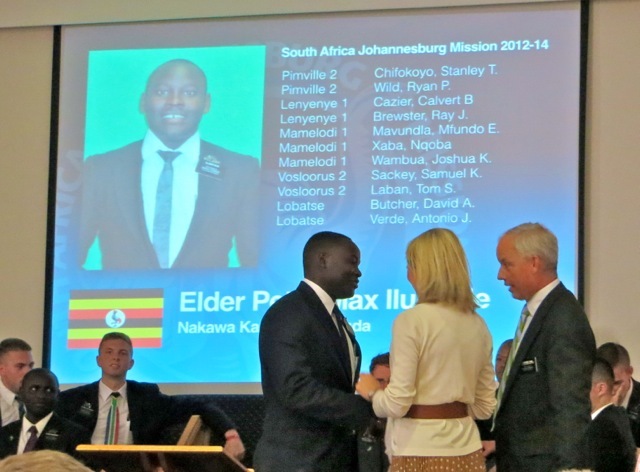 Elder McAllister is elder Mukasa new companion while elder Rami’s new companion is elder Oldroyd new companion. 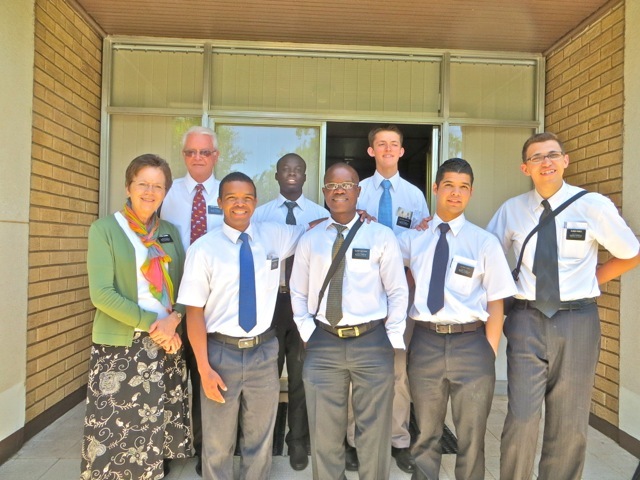 Here is the whole district with elder and sister Dummer. 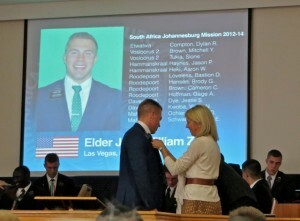 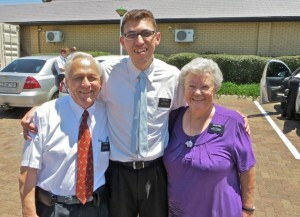 I found out that elder Rami is elder Taylor grandson! During the week there was a very heavy rain storm here in Ikageng. 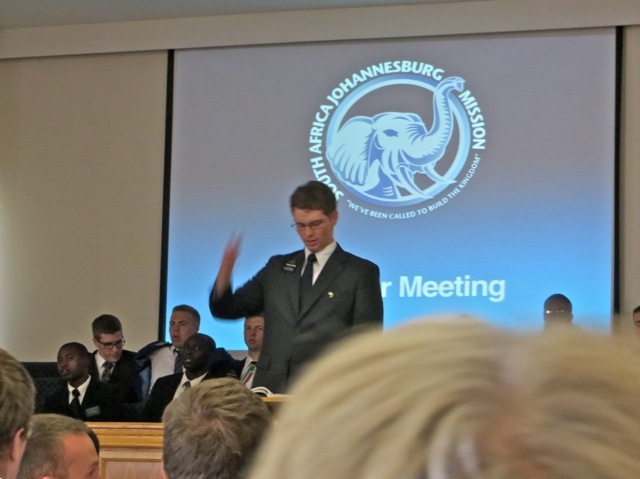 In Klerksdorp where we hold the district meetings there was a powerful hail storm that tore up the chapel roof and then the rain flooded much of the building. 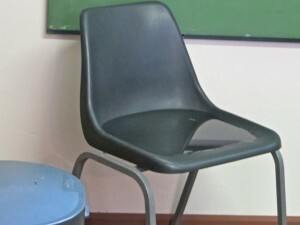 To give you an idea of how much water got into the building, this chair has about an inch of water sitting in it. 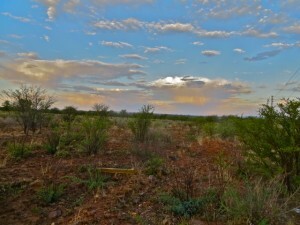 It is going to take a lot of work to get things dried out for Sunday’s meeting. 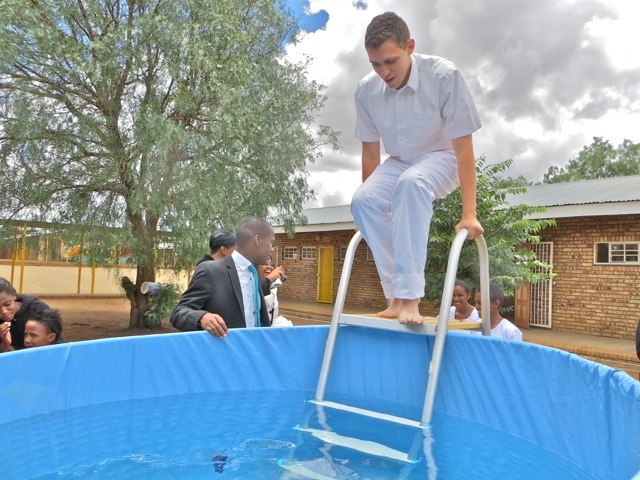 Unfortunately almost all the hymn books got wet. 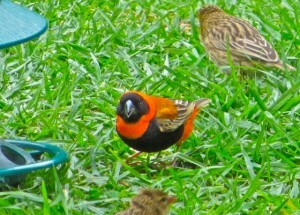 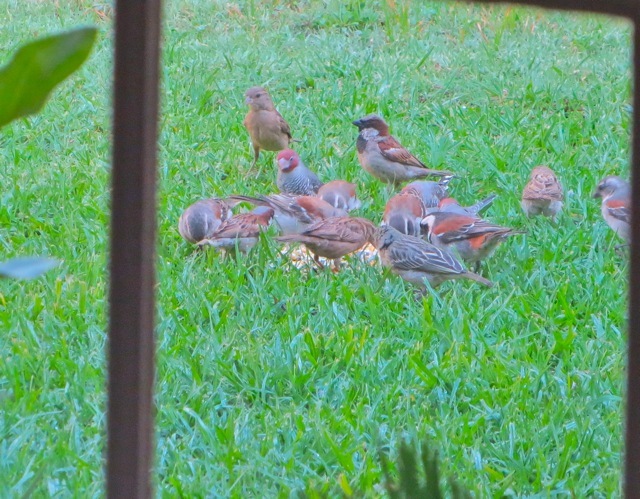 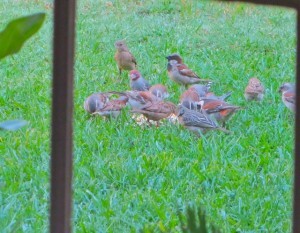 Friday morning I got a photo of this flock of about a dozen weavers and sparrows having breakfast in our backyard. I can not seem to get enough pictures of the red bishop weavers – there are at least two males who visit – so here is the latest. This entry was posted in Johannesburg Mission - Back To Africa on November 28, 2014 by Bill. Transfers – A Few More Pictures…. 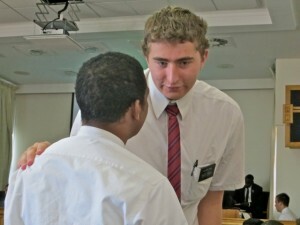 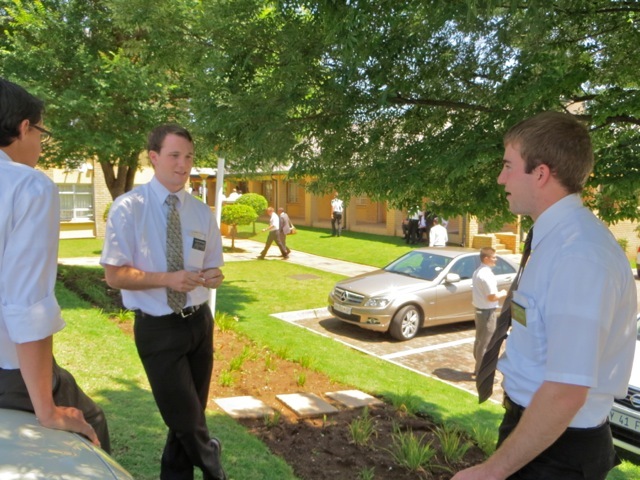 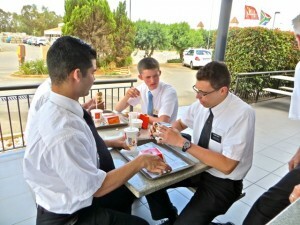 Elder Lyon talking to elder Rami. 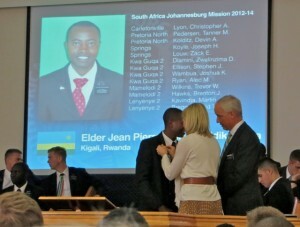 In another transfer post there is a picture of the two of them facing the camera. 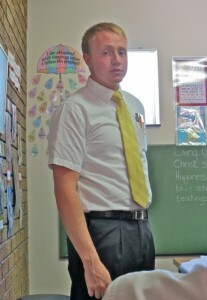 I was taking a picture of elder Johnson when this elder walked between us. Later I got a picture of elder Johnson with sister Dunn and her mother who is visiting from the US. Elder Rushton is the new companion with our dear friend elder Perez. 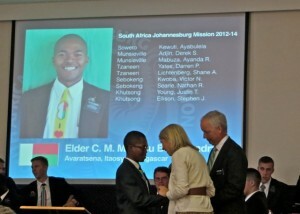 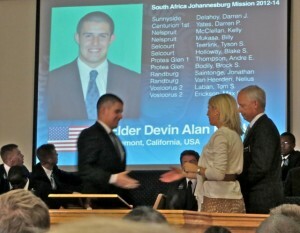 Elders Perkins and Johnson are now companions serving in Tembisa 1. 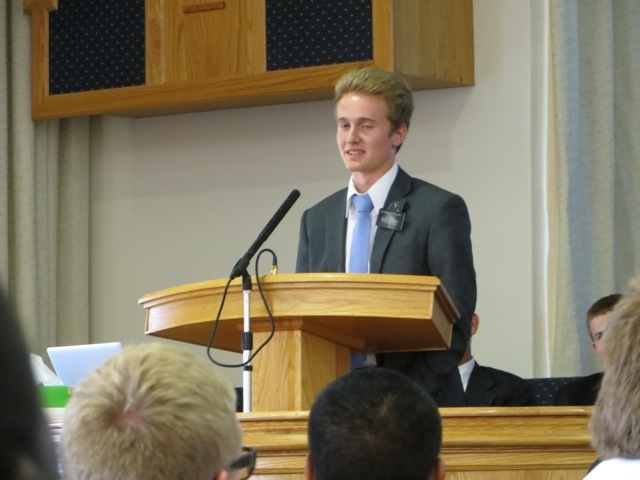 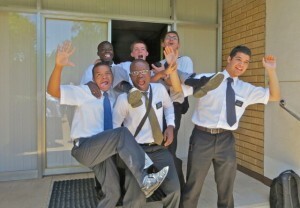 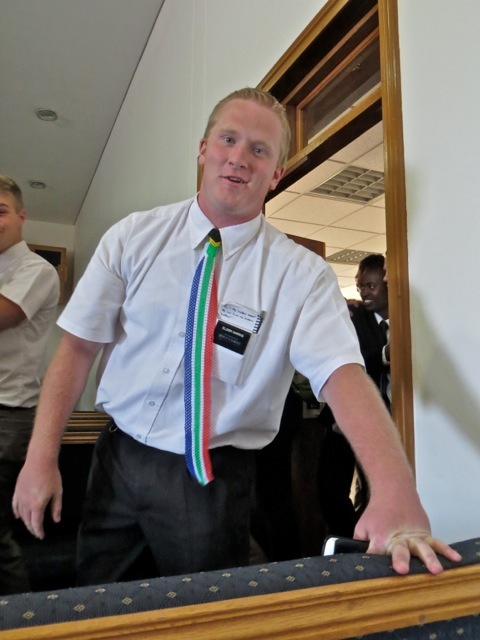 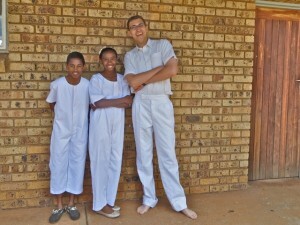 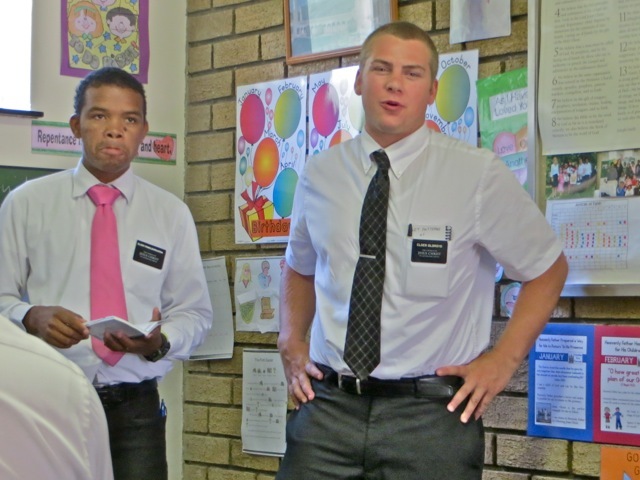 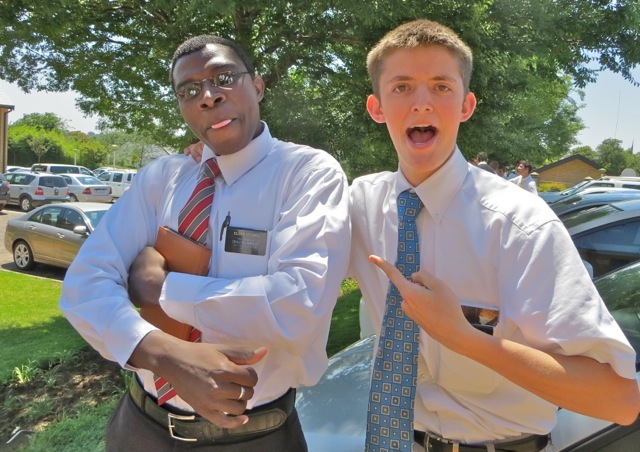 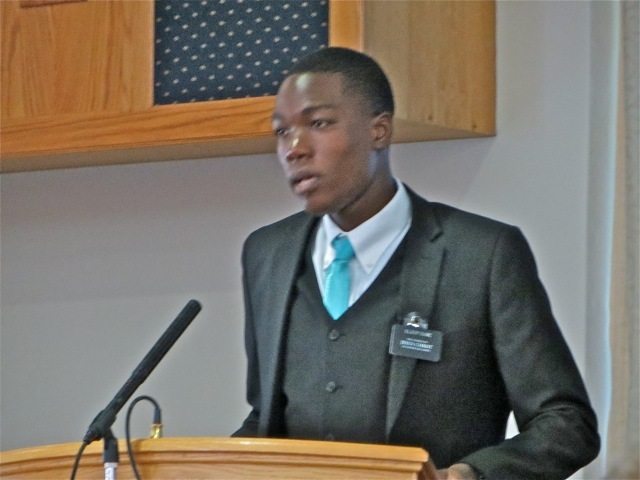 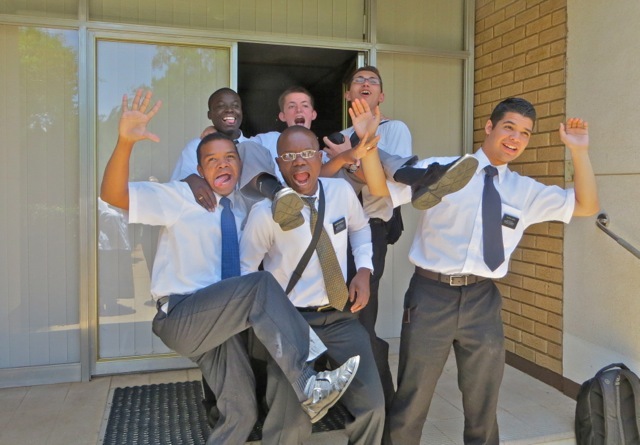 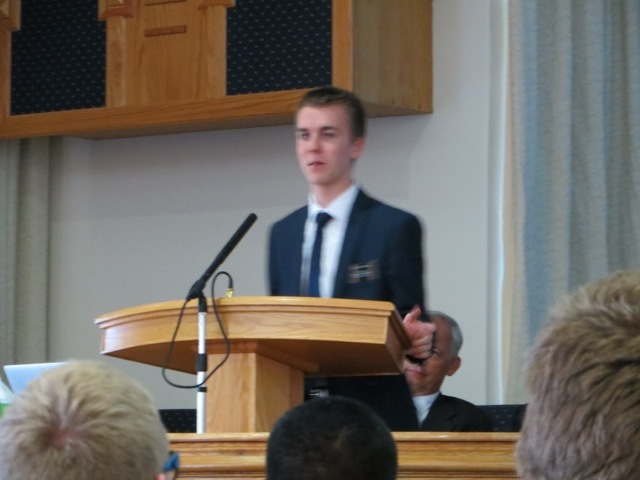 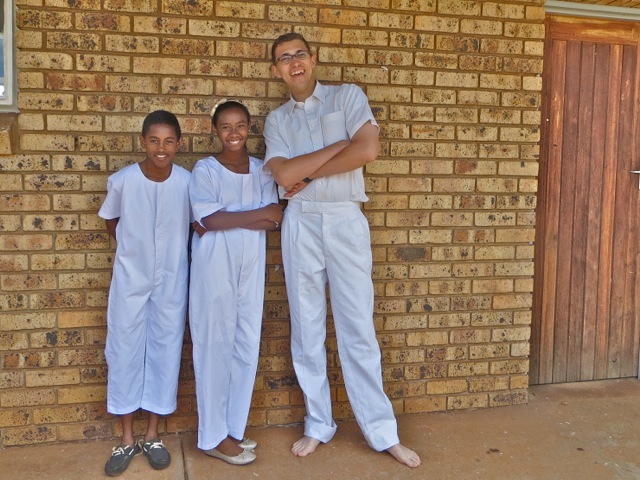 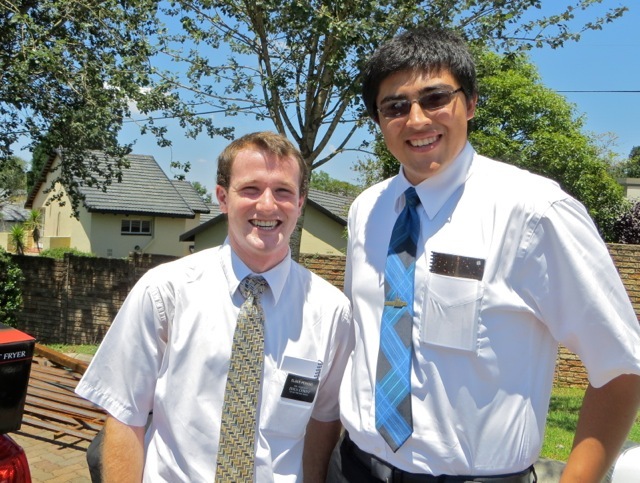 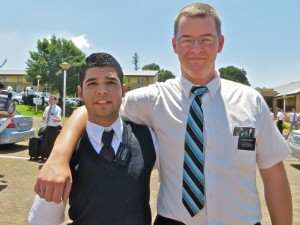 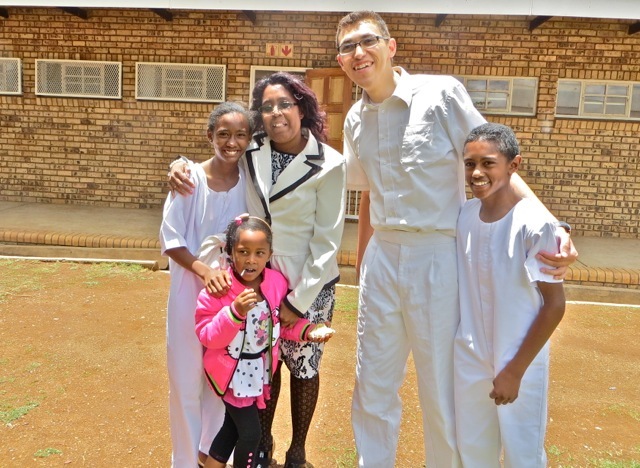 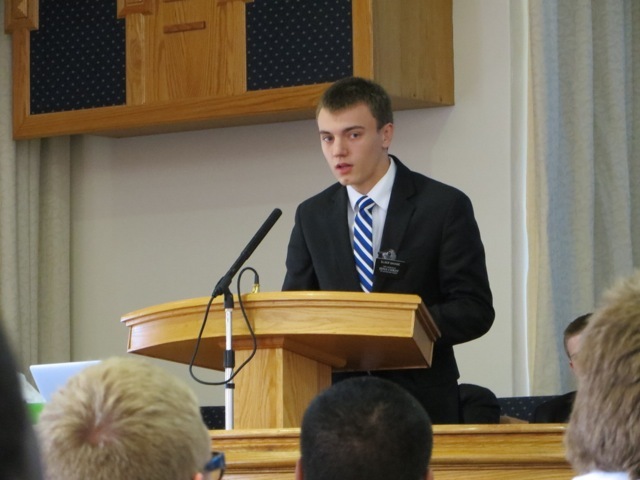 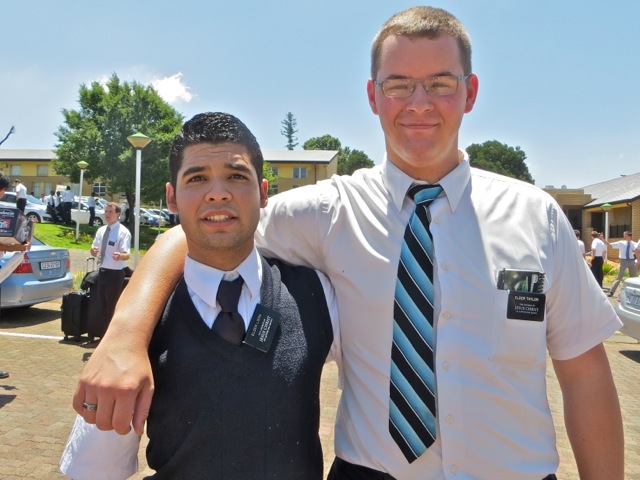 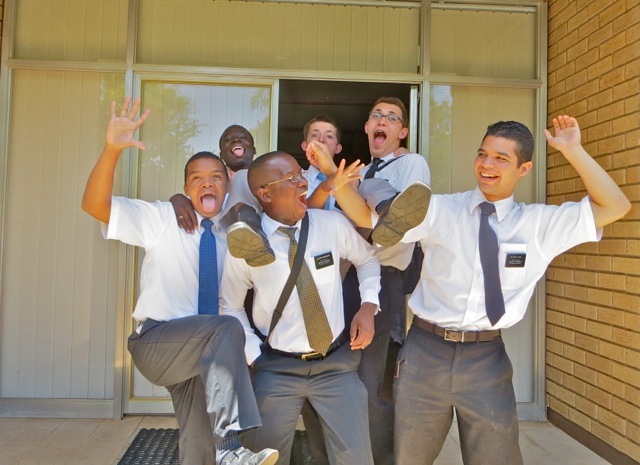 Elder Liera stays in Ikageng with elder Taylor from Arizona as his companion. We had to have one last photo with elder Perez as he moved to his new area and companion. 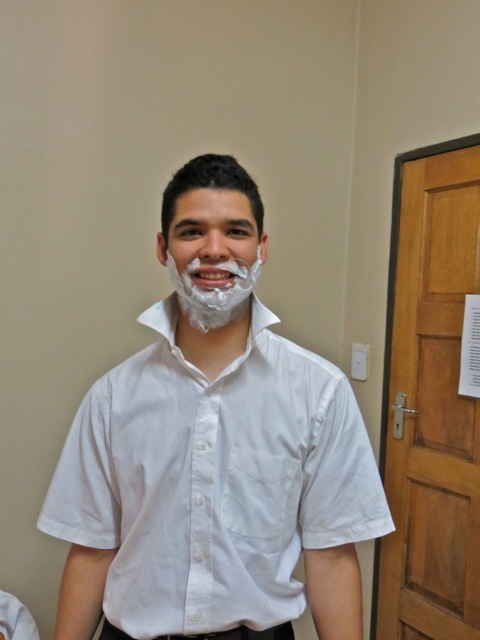 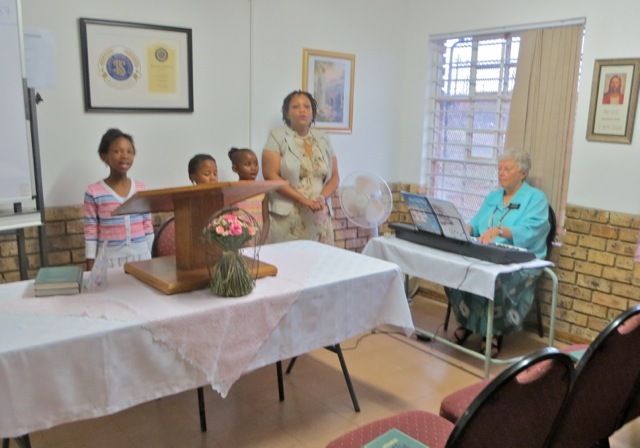 This entry was posted in Johannesburg Mission - Back To Africa on November 25, 2014 by Bill. 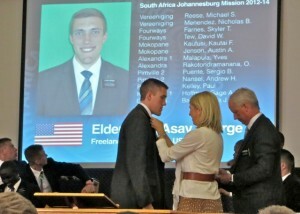 One of the traditions of transfer meetings is that each departing missionary gets pinned with a map of South Africa by sister Dunn and then a big hug by president Dunn. The photo behind them shows all the areas they served and who they served with. 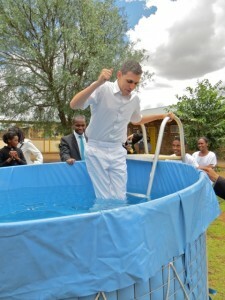 This is new feature with this transfer. 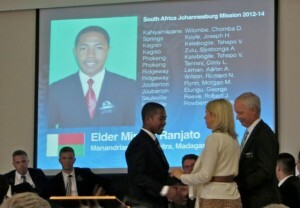 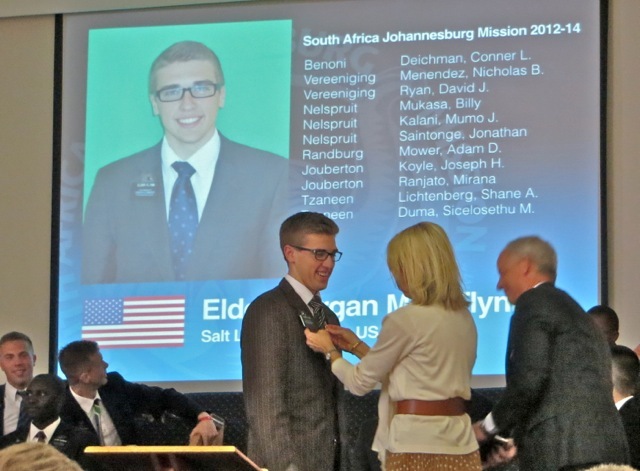 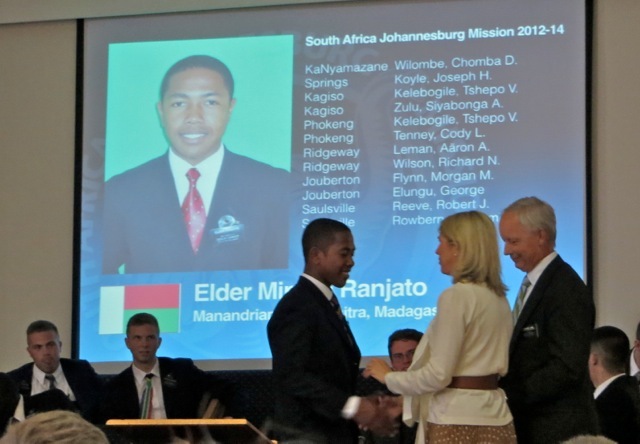 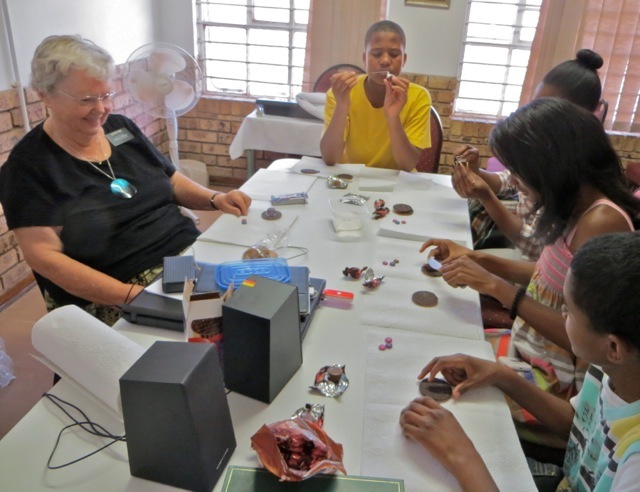 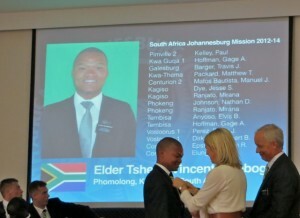 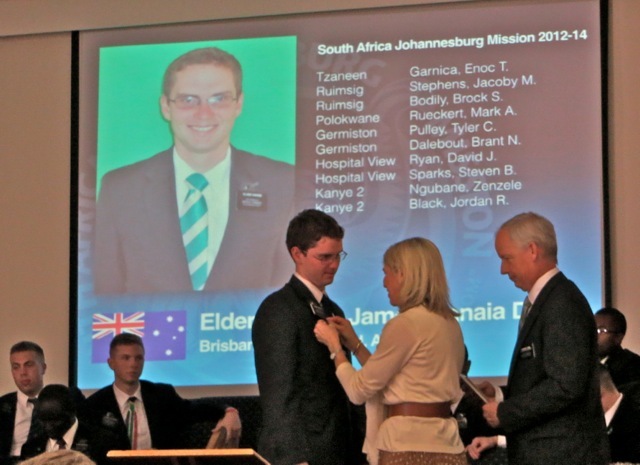 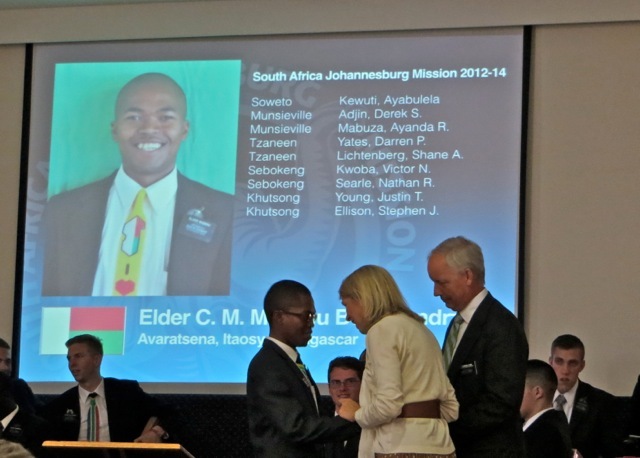 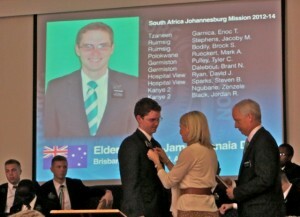 To learn more about these 9 new missionaries, where they are from, and their trainers go to president and sister Dunn’s blog and select the November 25, 2014 post…http://dunnsinjoburg.blogspot.com. 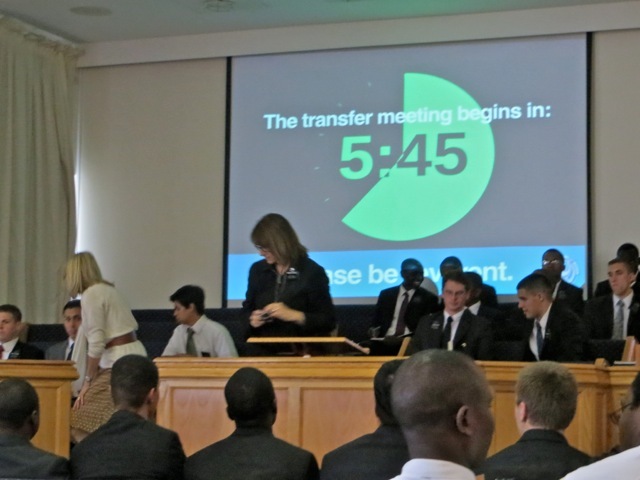 November 25 – Transfer Meeting! 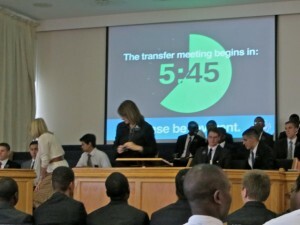 SPOILER INFORMATION INCLUDED – I took about 150 pictures at transfer meeting and will post about 130 of them over the next week. 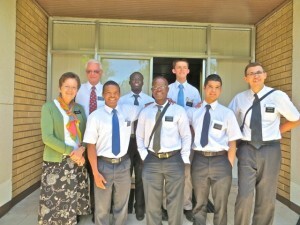 Although they probably have already written to their parents that they were scheduled to be transferred and if they are going to get a leadership or training assignment, I tend not to post where they are being transferred to or who their new companion will be until after next Monday when they have their chance to share the news. 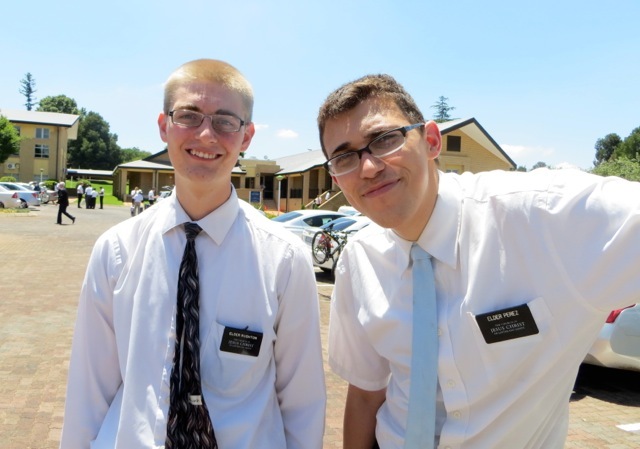 However some of the information does turn up here before that so if you want to be surprised by your missionary stop looking and reading now! Elder Perez was transferred out of Ikageng so he had to move everything. He and elder Liera managed to fill our boot and back seat with his stuff. This included his weights which is why it took two of them to get this box to the car. 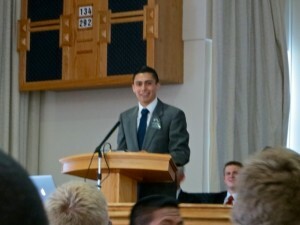 We are truly going to miss elder Perez. 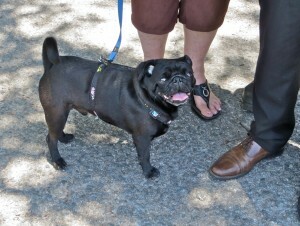 Especially Bill who sees him as a kindred soul. 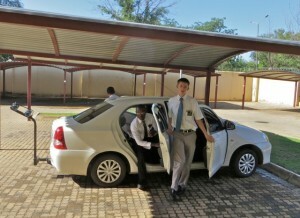 Elder Graham is exiting the car and elder Mayende is getting out of the back seat. 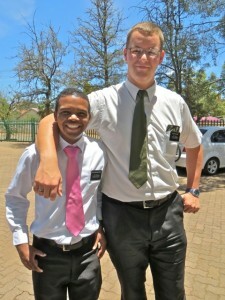 Both are great missionaries and are going to be missed in Klerksdorp and Jouberton. Transfer meetings are and exciting time for the missionaries. 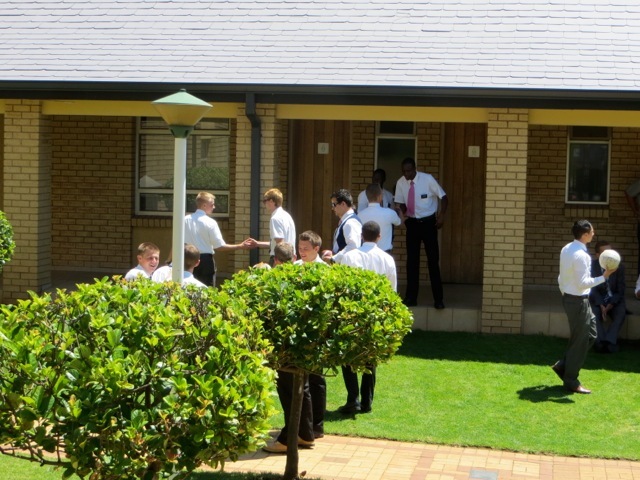 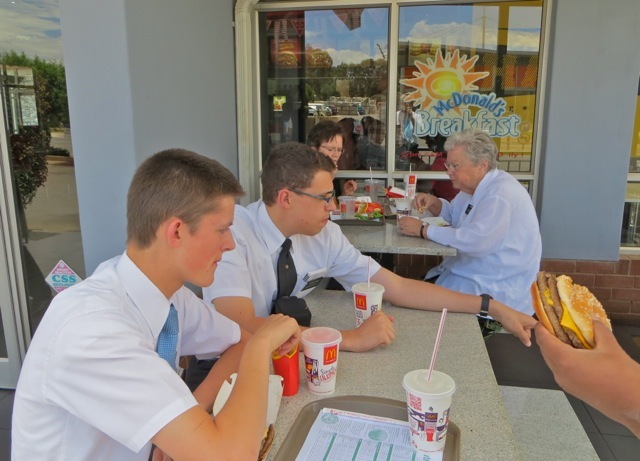 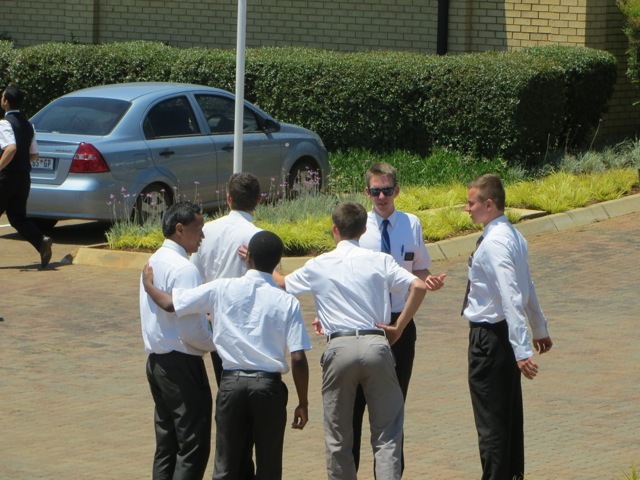 It is a time to meet and talk to MTC companions, elders they have served with in an area or district, and to find out what new area and companion will be theirs for the next 6 weeks. 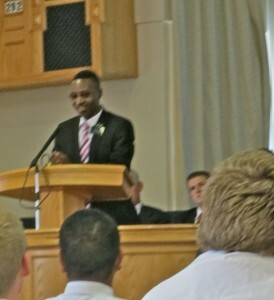 While we were waiting for the meeting to start, elder Harris came by and said hello. 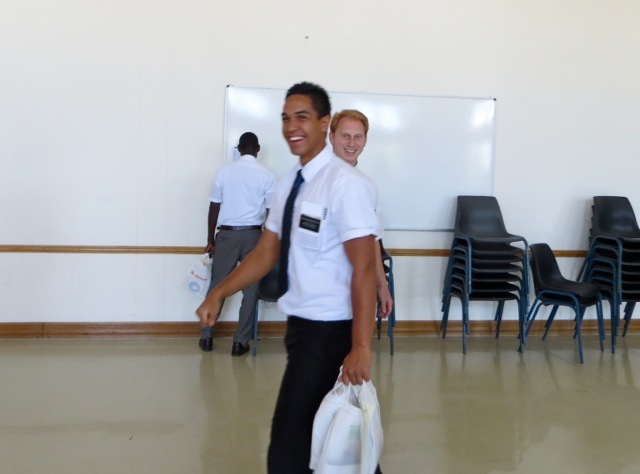 Elder Harris served in the district until a couple of transfers ago – he always has a great smile. 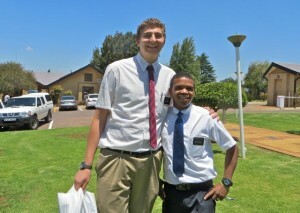 We do not really know elder Bryner except through his blog. 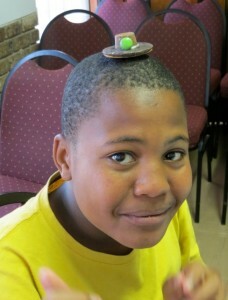 However his mother reads our blog and has let us know she enjoys the few pictures we have of her son. 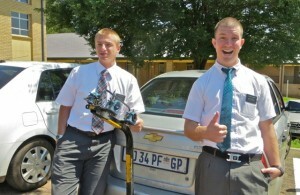 Elder Larsen with his thumb always up and his companion elder Saunders. 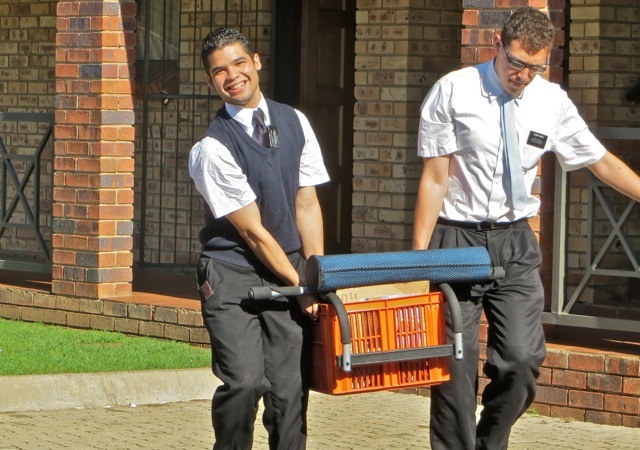 They are closing their area and so both are being transferred to new areas. Elders Graham and Clegg both have thumbs up. Elder Clegg is training one of the new missionaries this transfer. I think it is funny that the tallest elder in this picture has a very short name and the short missionary has a really long one…elder Lyon give a big hug to elder Ramiliarijaona who I call elder Rami as he serves in the Ikageng district. As far as I know elder Johnson is the only redhead in the mission. If you go back through this blog you will find that in almost any large group meeting there is elder Johnson. 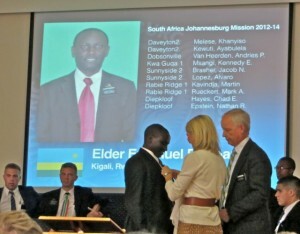 I had looked for him prior to the meeting but never saw him. 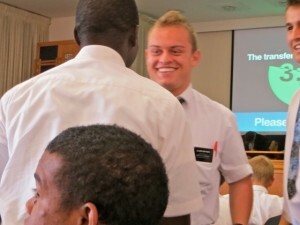 However as we were waiting for the meeting to start he walked in and gave us a big smile. 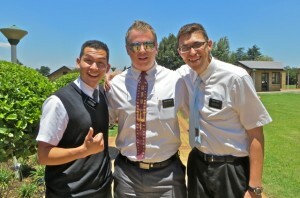 Elders Matos, Stapley and Perez had a good talk and posed for a picture. 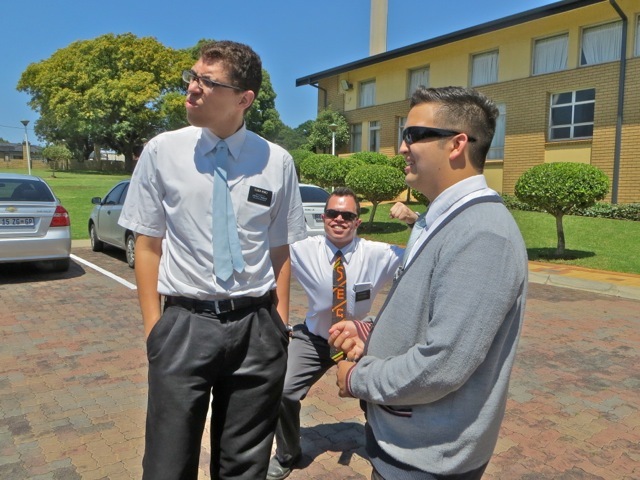 I love this picture because elders Perez and Carpenter had no idea that elder Segil was striking a pose behind them. 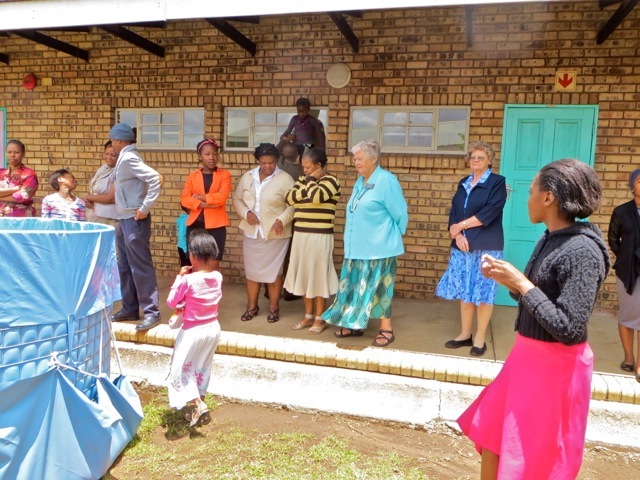 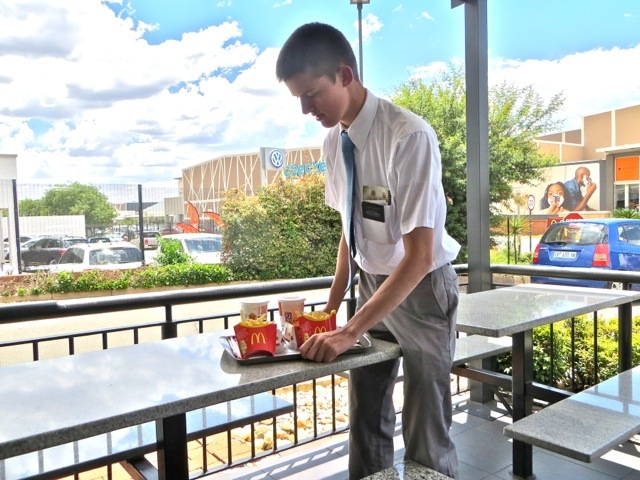 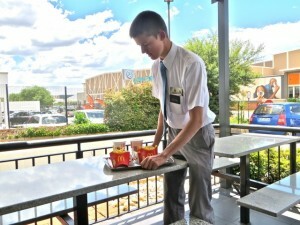 We got to meet both elder Segil and Carpenter when they were serving in the Vaal zone and we did flat inspections. 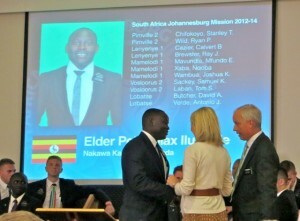 Elder Otieno stuck his tongue out at me – he was a very good district leader while he served here in the Ikageng district. 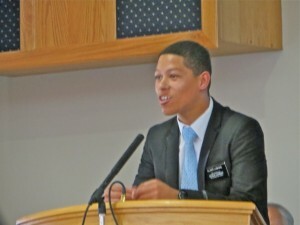 He now serves as a zone leader up North. Elder Graham is just being elder Graham. Elder Perkins is on the left and elder Compton is on the right. 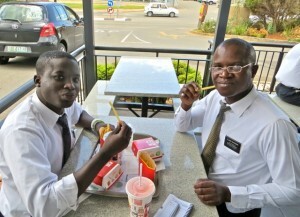 Both of them were serving in the Ikageng district when we got here 9 months ago. 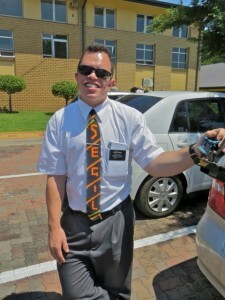 Elder Segil wants to make sure everyone knows his name. 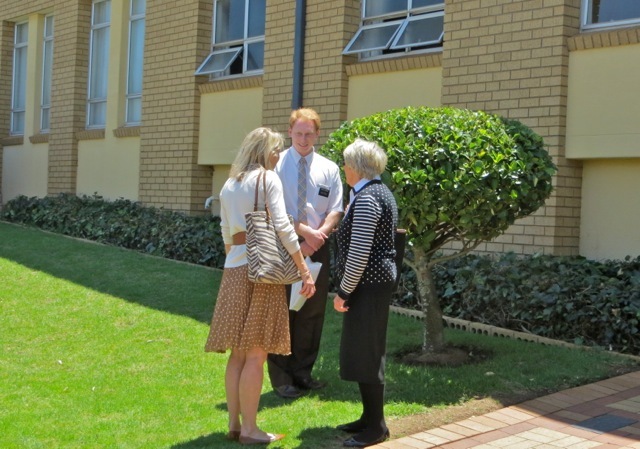 We got to know him as we did flat inspections for the elders in the Vaal zone. 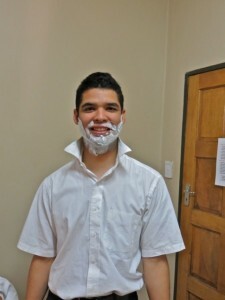 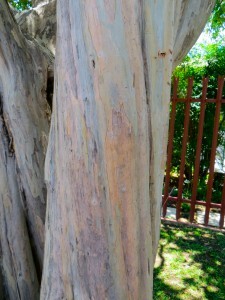 I also have enjoyed reading his blog and looking at his pictures. 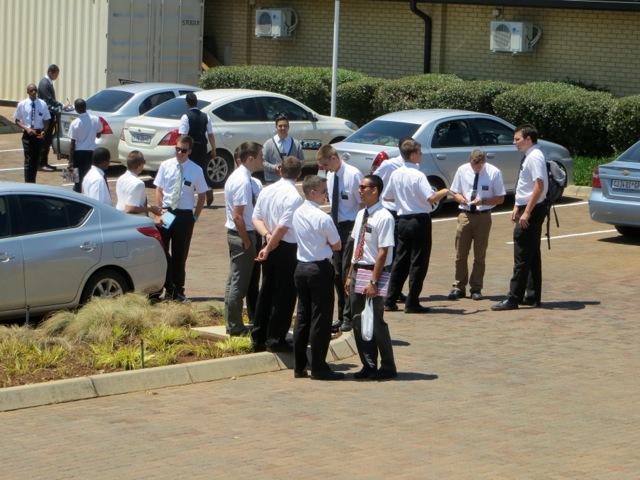 When it gets close to 11 the assistants get the missionaries moving towards the chapel where the count down clock tells how long before the meeting starts. The new missionaries sit on the front row and the departing missionaries sit up on the stand. 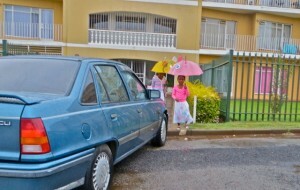 As I mentioned it was pouring rain when we woke up this morning. 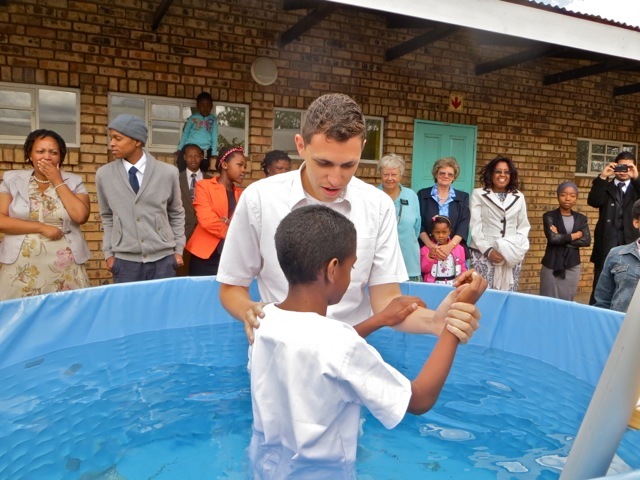 In my prayers I asked the Lord to stop the rain before the start of sacrament and then let the sun shine for the baptisms planned today. 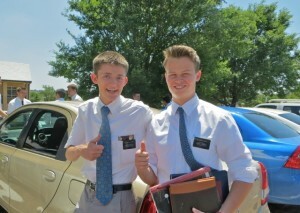 When the rain stopped about 30 minutes before the block was to start I thanked him for this blessing. 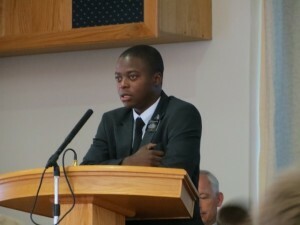 I felt that he would grant also the second part of my prayer. 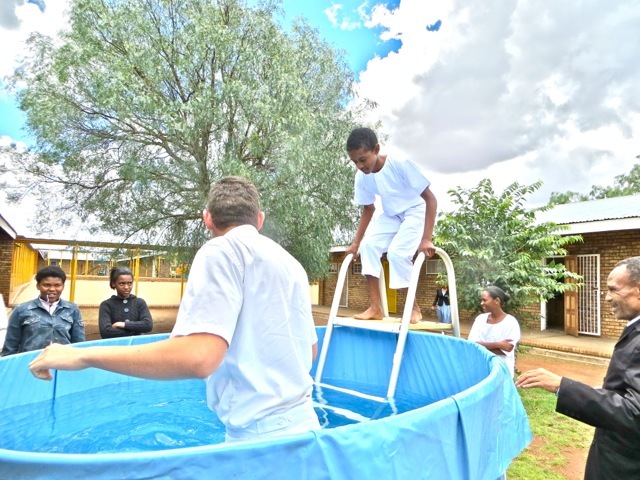 However the dark clouds hung around and threatened rain until about a half hour before the baptism program was to start and then the clouds parted – they did not go away however – the sun came out and bathed the yard with light and warmth. 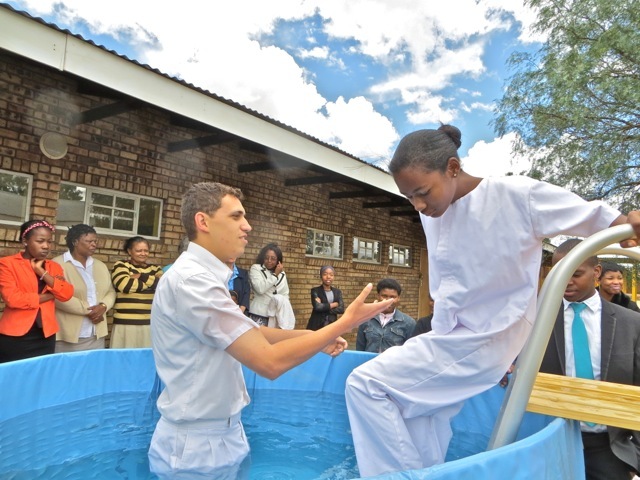 About an hour after the baptism program was over and the saints had time to walk back to their homes, the clouds came back and rain poured down again. 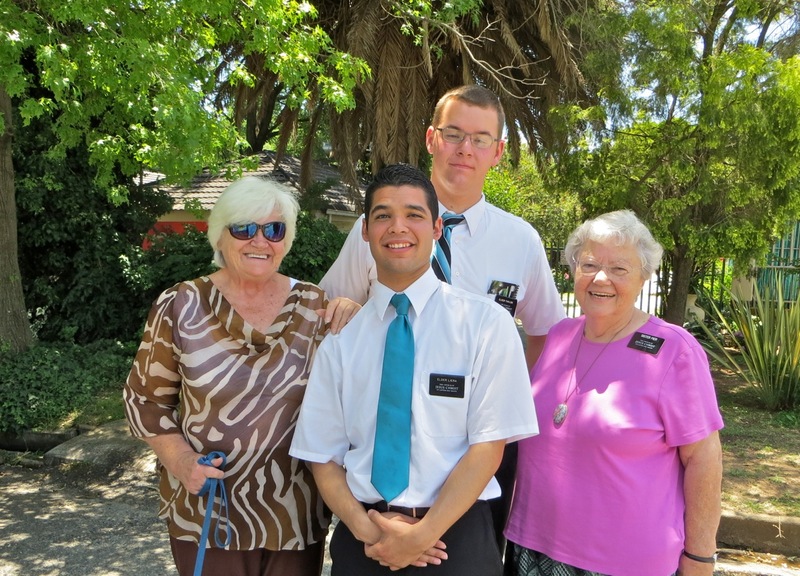 Elder Perez with the candidates, their mother and cousin. 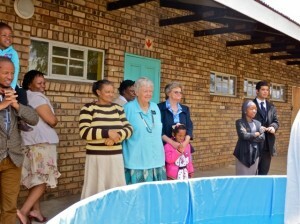 Members of the branch waiting to see the baptism. 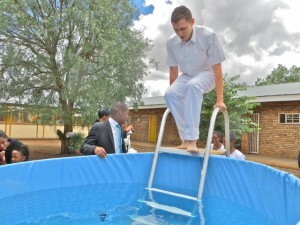 Elder Perez prepares to enter the water which is insists is not cold. 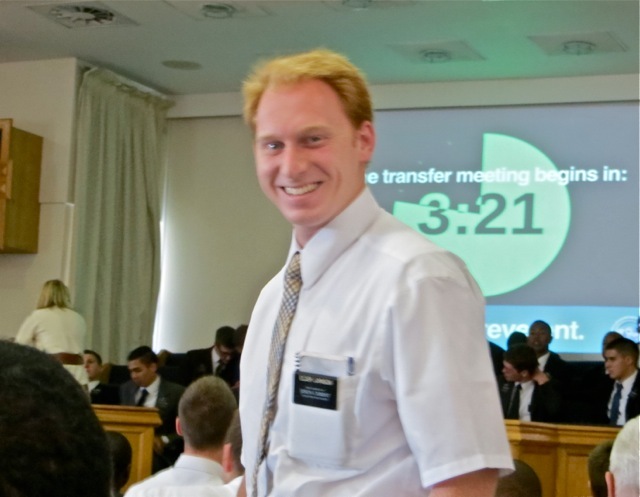 It must have been the spirit keeping him warm. 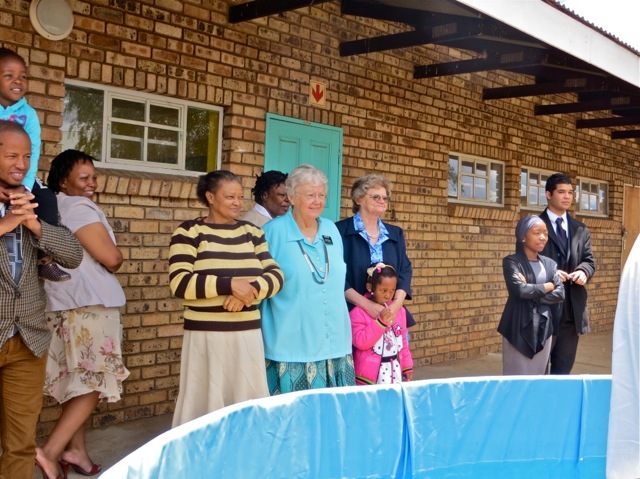 Jacque is the first to be baptized with brothers Simon and Omphile as witnesses. 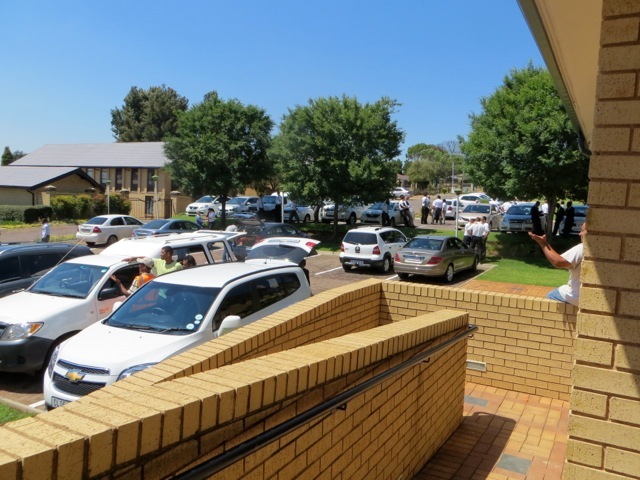 Everything went perfectly so there was no need to repeat the ordinance. 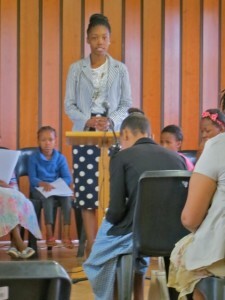 Shavonne joined elder Perez. After she was baptized the members applauded and we back to the chapel to close the service. It is a great blessing to see these young people be baptized. 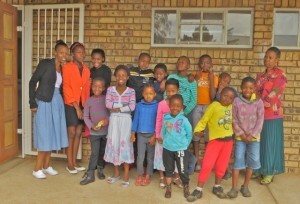 They have great spirits and their mother is super supportive. 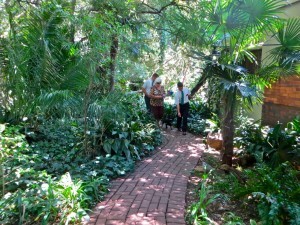 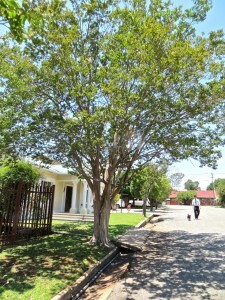 This entry was posted in Johannesburg Mission - Back To Africa on November 23, 2014 by Bill. The morning started with it pouring rain and since some members must walk a long distance that means some people will choose to stay home. But about 30 minutes before the meeting was to start it cleared up and most of the saints came. 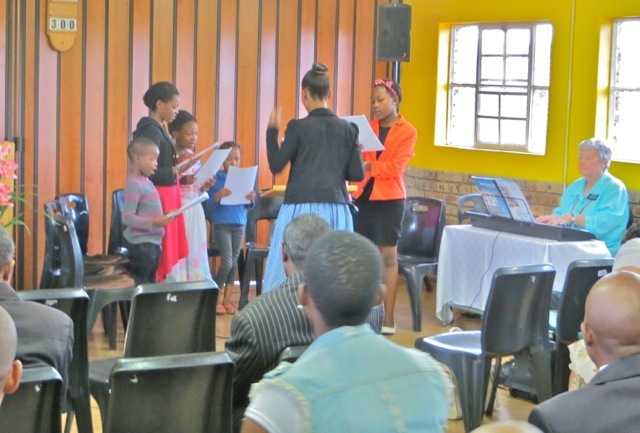 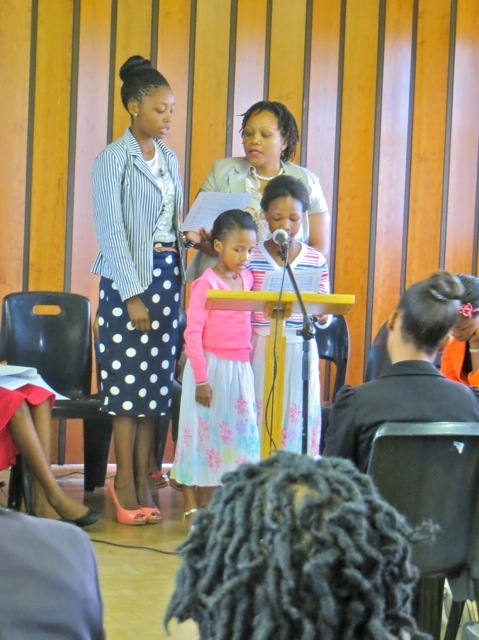 Besides having the opportunity to take the sacrament and renewing their baptism covenants, they were treated to a great program by the small but powerful Primary. 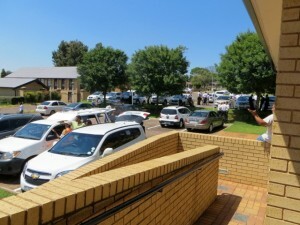 As you can see the number of those participating were small in number but mighty in voice and spirit. 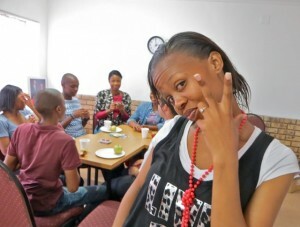 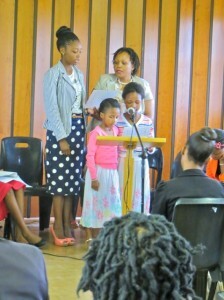 Sister Thato Kujane joined the Primary for the day and both gave a talk and sang with her family. Later in the day the primary grew when a number of neighborhood children who’s families are taking the missionary lessons joined in for the regular Primary time. Friday we took the Ikageng elders to district meeting in Klerksdorp. 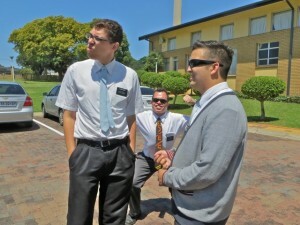 Elder Liera was not quite ready to go when we showed up at their apartment. One mission tradition is that at last district meeting before transfers, everyone makes predictions about who is going to be transferred, where they will be transferred and any new position they might receive. 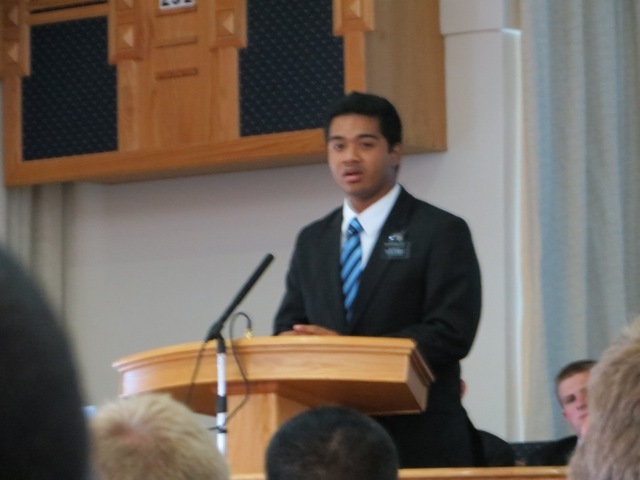 Elder Liera might not have been ready but his prediction was the only one that was 100% correct. 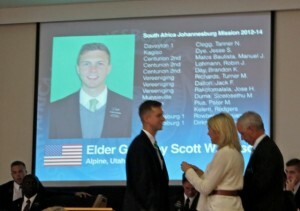 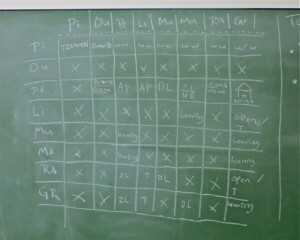 sister Dummer also took a picture of the predictions. 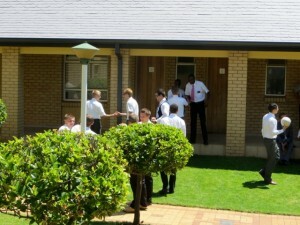 After the meeting it was time to take some last pictures of the district with the couples and then they are let lose to just have fun. 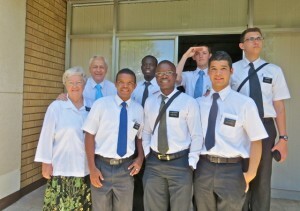 I am happy to say that although I was worried about elder Graham’s safety, all the elders survived the photo session. 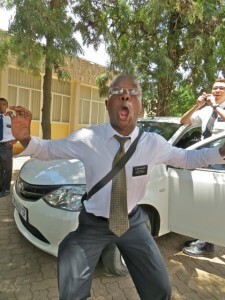 Below elder Mayende reveals his true inner self. 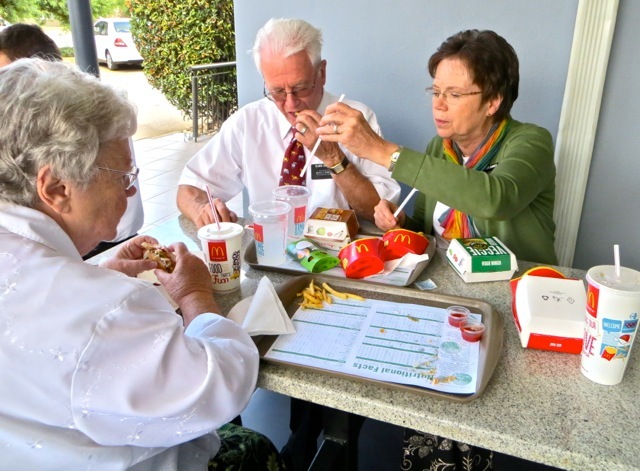 The next stop was McDonalds for our traditional Last Lunch. 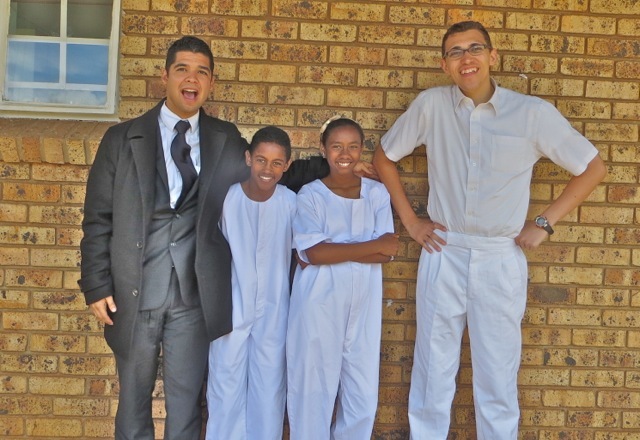 It is now so ingrained in the district that we will continue it until we are released! 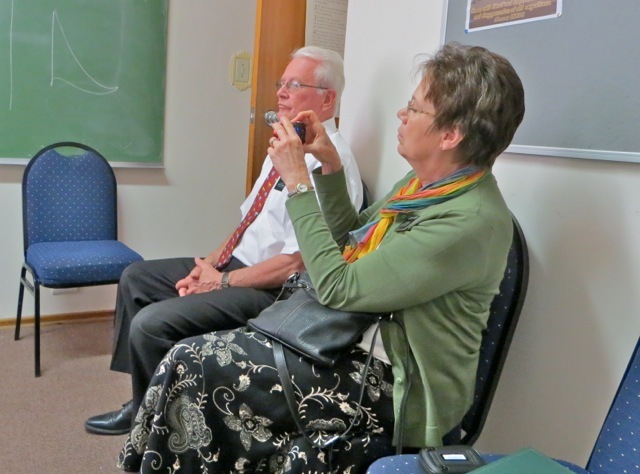 It is a way for the senior couples to express their thanks for how hard these elders work to bring souls unto Christ. 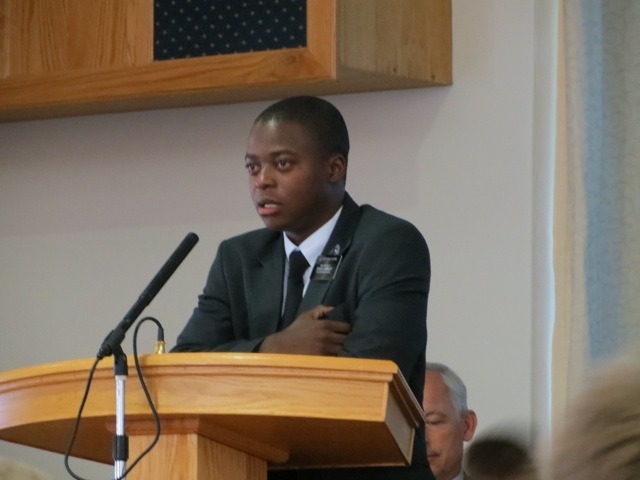 Elder Graham took the wrong tray and had to then find his and elder Mukasa’s tray. 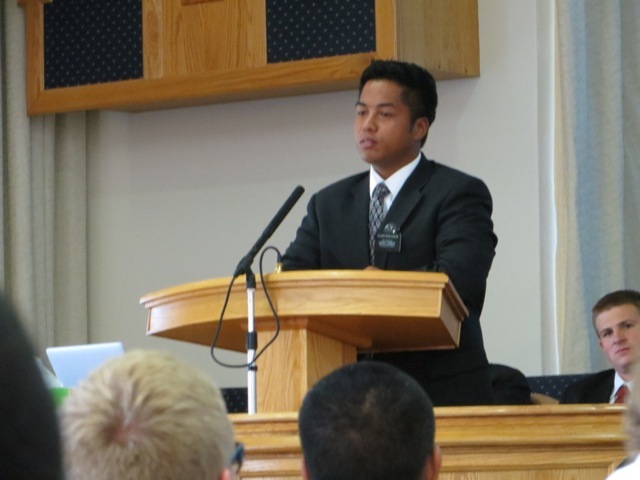 Elder Rami – short for Ramillarijaona – is from Madagascar. He told me that tribal names are all long. 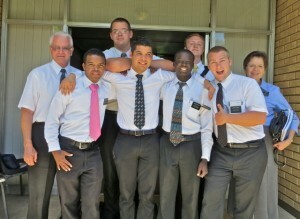 Elder Liera, Graham and Perez with elder Mukasa hidden behind elder Liera. 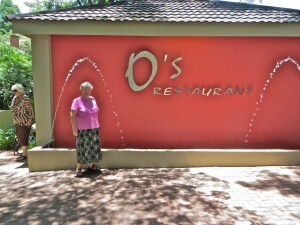 Mary seems to be enjoying her food. 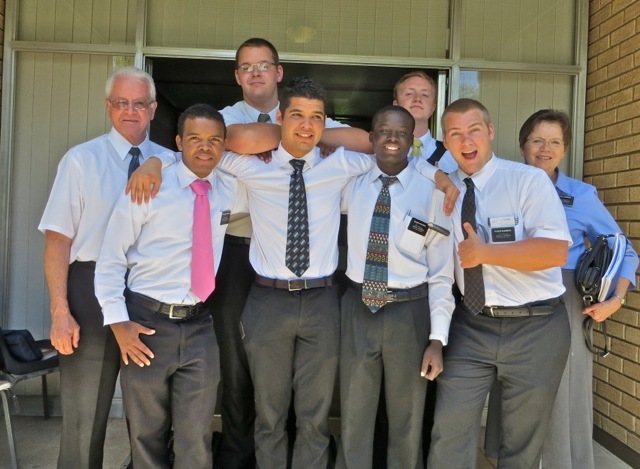 What a great blessing it is to share time with these powerful elders – we truly come to love each of them. 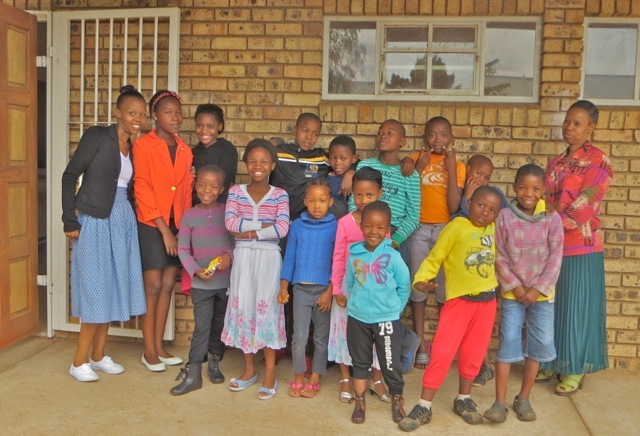 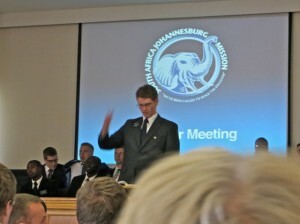 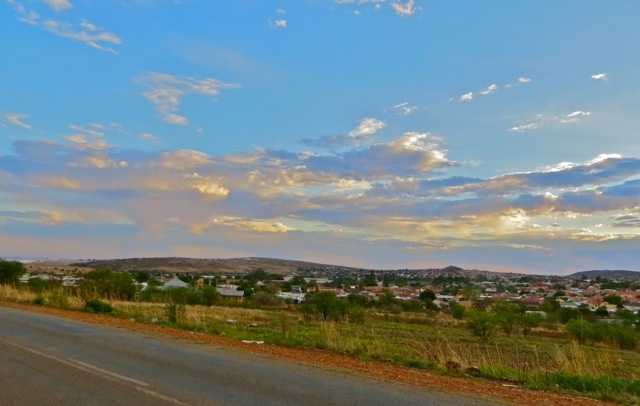 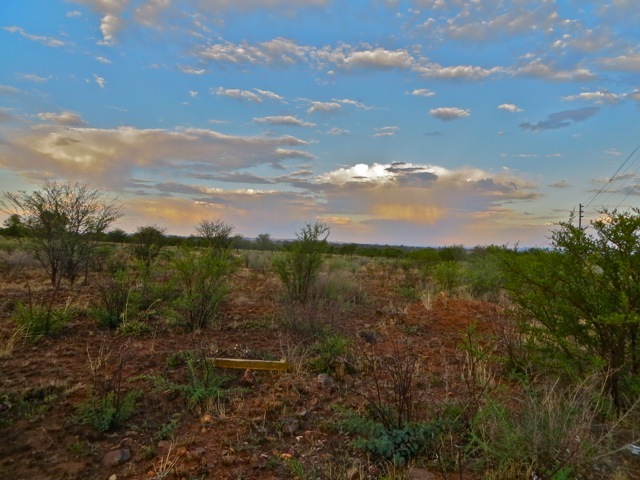 This entry was posted in Johannesburg Mission - Back To Africa on November 21, 2014 by Bill. 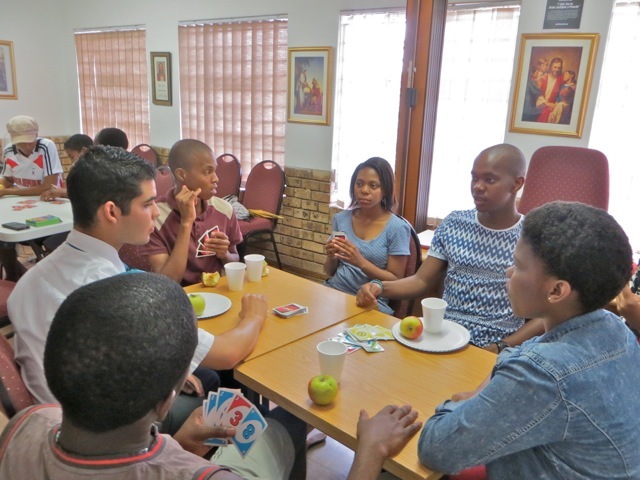 Seminary – YM – YW Activity- Sunset! 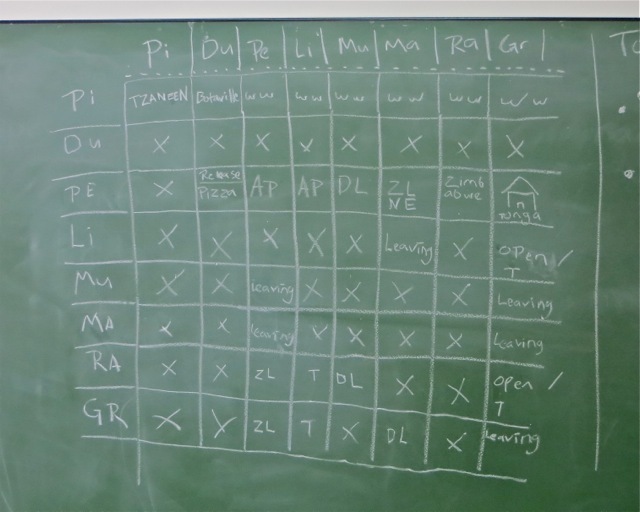 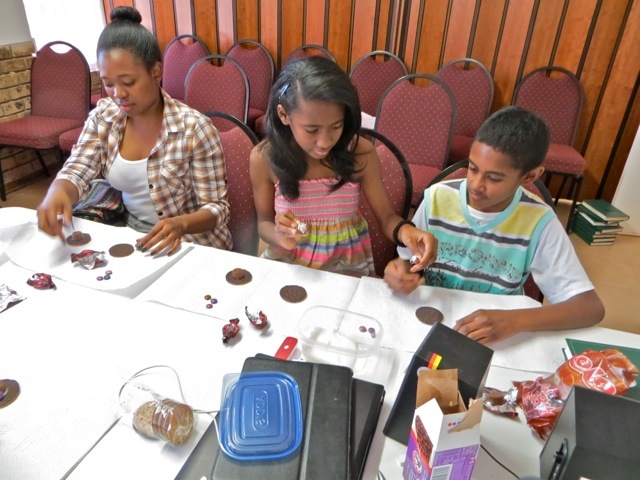 Thursday is Seminary and YM/YW Activity Afternoon…Mary teaches Seminary and runs most of the activities. 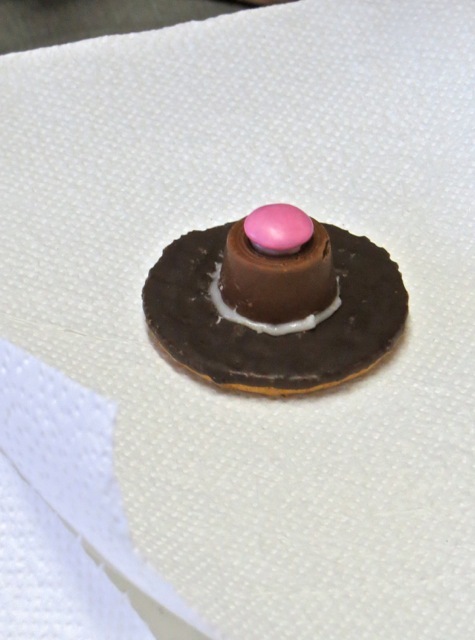 This week’s activity included her giving a short history of Thanksgiving and then she had the youth make cookie based Pilgrim hats. 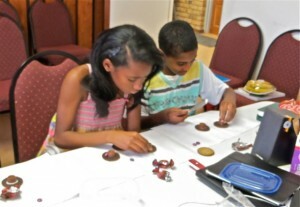 They had a great time and got pretty creative. 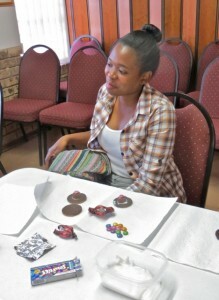 But while the YW took their hats home, the YM ate their creations. 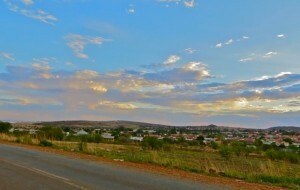 As we came off the hill and headed home Mary said I should stop and take pictures of the beautiful cloud formations the stretched over the town and landscape.